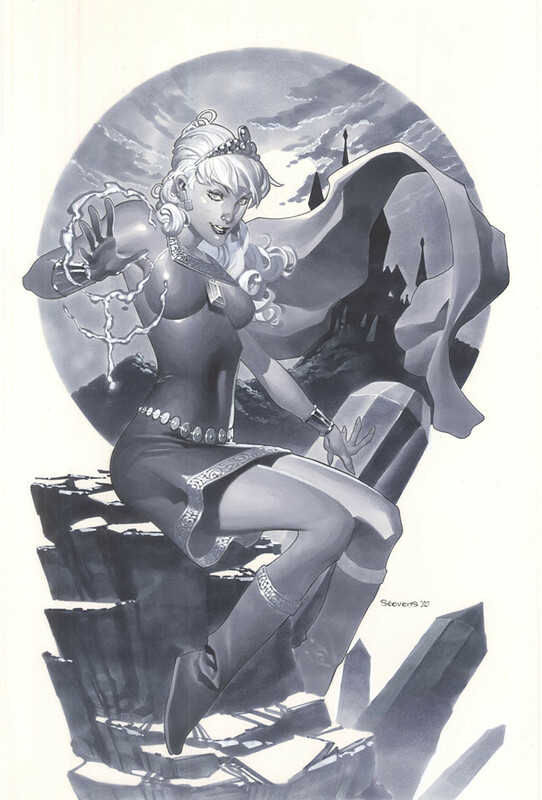 DC Comics has a magical gem of a property that hasn't been touched in years: Amethyst, Princess of Gemworld. 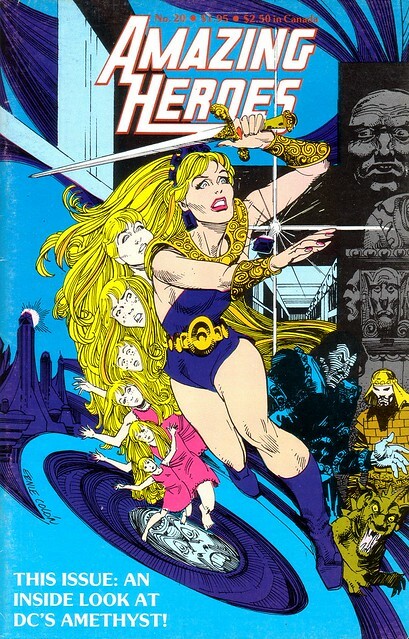 The original 12 issue maxi-series that DC published in 1983 had a great premise: 13 year-old Amy Winston, who has lived all of her life in suburbia, discovers that she is really a princess from another dimension called Gemworld. And by crossing over into that world, Amy is transformed into a fully mature adult with the powers to battle the evil Dark Opal. Most of you probably have no idea about this series. Chris Stevens (chris2d from deviantART), produced this wonderful illustration of Amethyst without having any history with the character either. He did a superb job nonetheless. Chris says that this piece was done with "prismacolor/copics with white paint and color pencil on vellum bristol board". 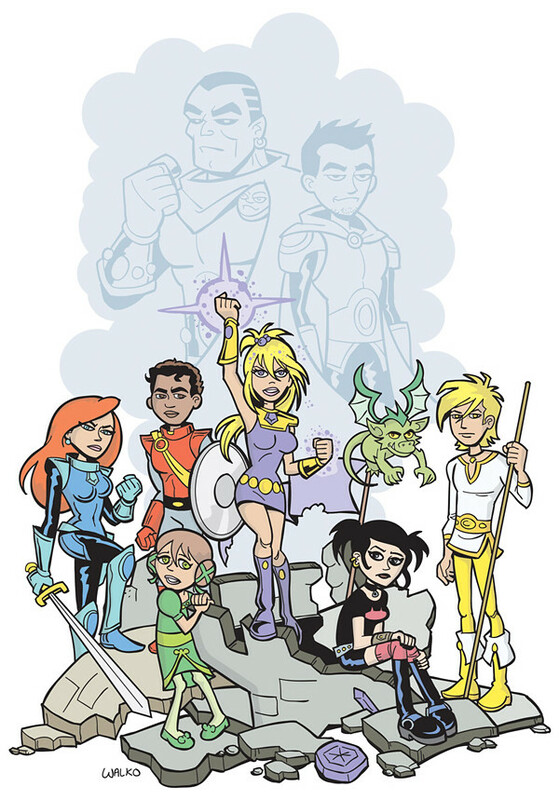 Here's an illustration by Amethyst co-creator and original artist, Ernie Colon. This cover appeared on Amazing Heroes 20 in 1983. Another cover by Color for issue #2, shows Amethyst using her powers against Dark Opal's assassin, Carnelian. The first 12-issue maxi-series delivered an engaging tale for an audience that is buying/reading lots of books today. Amethyst had a female twist on the Shazam/Captain Marvel idea, with lots of intriguing possibilities for Amy to explore her adult self. Writers Dan Mishkin and Gary Cohn conceived a new universe in Gemworld, which wasn't (as far as I recall) heavily tied to the DC Universe. It was fertile ground for a new mythology. 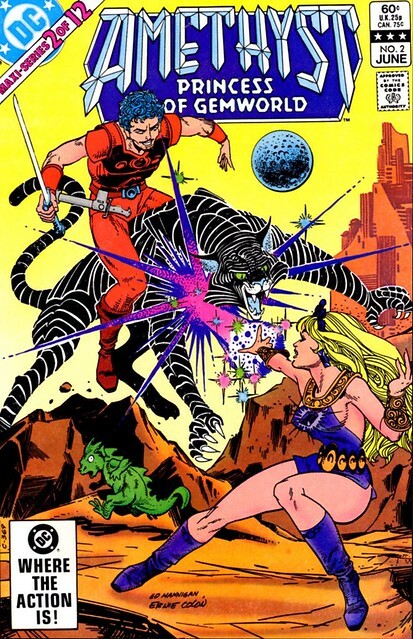 When the Amethyst series continued after the maxi, writers tried linking Gemworld in more tightly with DC continuity and the Legion of Super-Heroes magical villain Mordru--a big mistake in my opinion. Last month, Project Rooftop featured this nifty redesign of Amethyst by Bill Walko. Check out the link below for Bill's comments on the re-design. Nuff Said! I have noticed that any references to Amethyst say she was targeted toward girls. I think the only reasoning behind that statement is that she's a female named after a gemstone. Otherwise, with much thanks to Ernie's imaginative artwork, the original series had a leering darkness throughout it. The followup regular series went more girly with Ric Estrada's art and lots of cute magic animals, and tried to regain the dark edge too late. I definitely think the series deserves a trade paperback release and even a look at a movie of some form.